As one can tell from the title of my at home business, "Pigment of Your Imagination", I have a love for color. 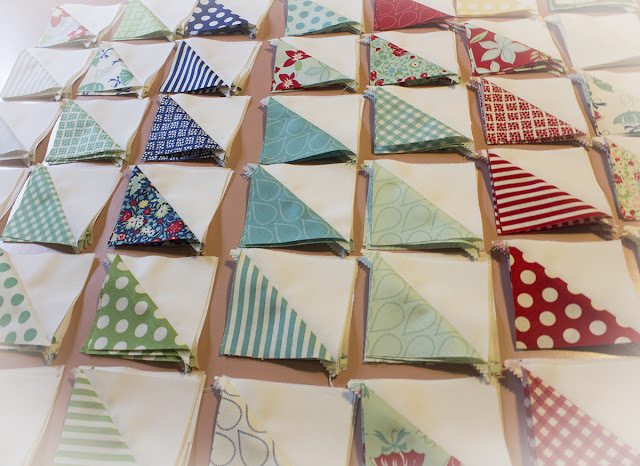 Whether it is painting or my new love, quilting, color plays a big part in the design. Neutral or white backgrounds with pops of color make my heart sing. The only color I'm not in love with is that pink countertop beneath all that wonderful color in the image below. You can read about those countertops at my blog post "Living With Pink Kitchen Countertops". In that post I was amazed at the people who loved my pink countertops as you can see from the comments. I've learned to deal love them and simply tie them in with other colors. One thing I've learned over the years is don't be afraid of color. Color is generally easy to fix and inexpensive to change (except when it comes to countertops with a built-in hutch sitting on top of them). These pinwheels are so fun and easy to make using precut charm packs. Simply sew a solid color and a printed five inch square with right sides together around all four sides. Then using a rotary cutter, ruler, and cutting mat, cut them on the diagonal both ways (like a big "X"). Press the seams to the dark side. Arrange the four sections into a pinwheel and sew together. 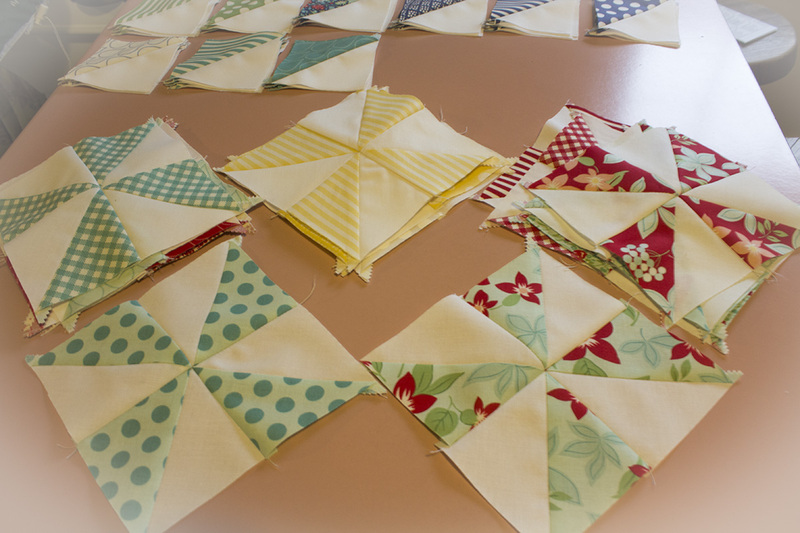 I plan to sew all these pinwheels into another lap quilt and will share as I go along. On another thought, we survived another horrible storm yesterday with tornado sirens blasting their warning. I'm thinking fall looks pretty good right now. I don't want to sound like a whiner so I will thank the good Lord for seeing us through this wild ride this summer. What are you thankful for today? Oh, and I'm also thankful for all this beautiful color in my life! I enjoyed seeing all your quilt squares. 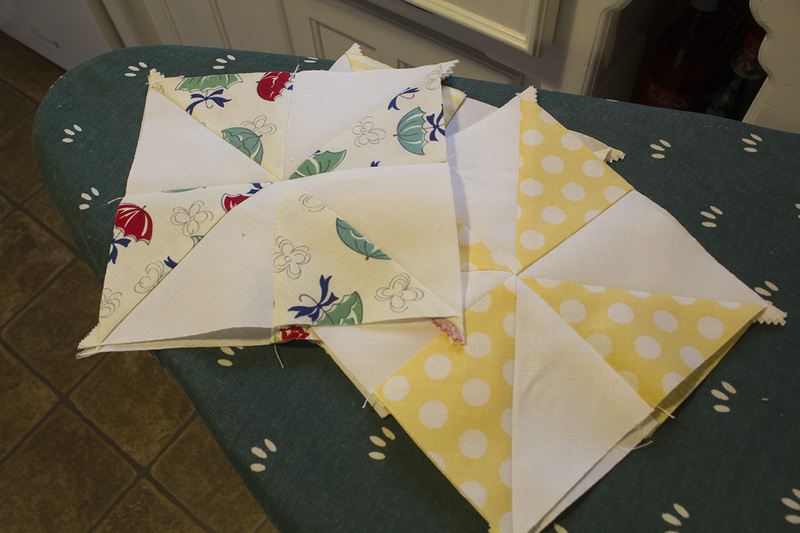 I did a bit of quilting today making two potholders. Ha! I am so intimidated by making a quilt. I'm having trouble finishing a doll quilt. I think an artist would have learned that any "mistakes" can be compensated for or else celebrated. As for fall, I think it is already here in our corner. I loved your pink countertops, and love your pinwheels. Absolutely adore your color & pattern choices ... very vintage chic - LOVELY! Looking forward to seeing the quilt all together :) Love that you are continuing your passion of color with textiles! I can't wait to see this quilt finished. It looks like it's going to be wonderful.